1. Pre-heat the oven to 190C/170C Fan/Gas 5. Put the salmon on a sheet of foil, season and sprinkle with 4 tbsp water. Wrap to make a parcel, sealing the edges leave room for the air to circulate. Bake for 15 minutes. Remove the skin, flake the fish and mix with cooking juices. 2. Rinse the spinach, stir fry until it wilts. Drain. Chop roughly and season with salt, pepper. 3. Heat the parsley sauce and mix 3/4 with the salmon and spinach. 4. 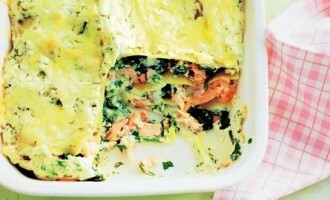 Layer the lasagne with the salmon and spinach in an ovenproof dish. Finish with the reserved parsley sauce. 5. Sprinkle the cheese on top and bake for 25 minutes. Serve with salad.